When a child begins to participate in recreational activities and organized sports, injuries can occur. 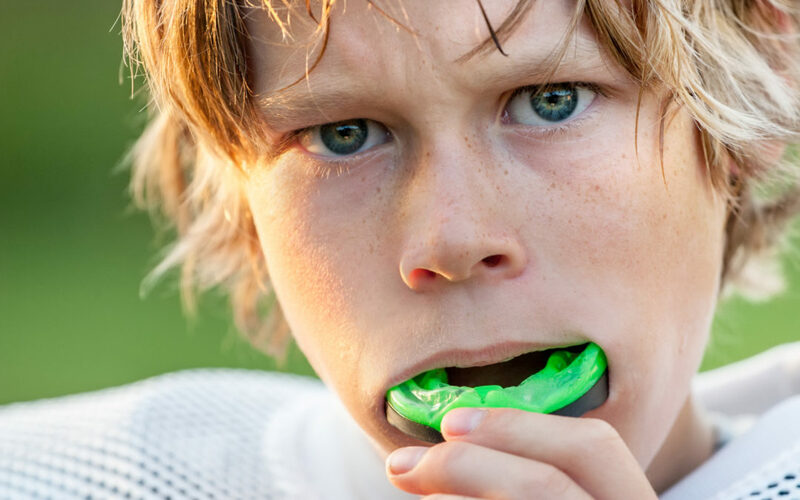 A properly fitted mouth guard, or mouth protector, is an important piece of athletic gear that can help protect your child’s smile, and should be used during any activity that could result in a blow to the face or mouth. Studies show that athletes are 60 times more likely to experience a dental injury not wearing a mouth guard. In fact, it is estimated by the American Dental Association that mouth guards prevent approximately 200,000 injuries each year in high school and collegiate football alone. And you know it must help to prevent injuries in the NFL as well!! Stock mouth protectors are preformed and come ready to wear. They are inexpensive and can be bought at most sporting good stores and department stores. However, little can be done to adjust their fit, they are bulky, make breathing and talking difficult, and they provide little or no protection. At our office, we typically do not recommend their use. Boil and bite mouth protectors also can be bought at many sporting goods stores and may offer a better fit than stock mouth protectors. The “boil and bite” mouth guard is made from thermoplastic material. It is placed in hot water to soften, then placed in the mouth and shaped around the teeth using finger and tongue pressure. If you need help fitting these types of mouth guards, please do not hesitate to contact our office. Custom-fitted mouth protectors are individually designed and made in a dental office or a professional laboratory. First, we will make an impression of your teeth and a mouth guard is then molded over the model using a special material. Due to the use of the special material and because of the extra time and work involved, this custom-made mouth guard is more expensive than the other types, but it provides the most comfort and protection. Generally, mouth guards cover your upper teeth only, but in some instances (such as if you wear braces or another fixed dental appliance on your lower jaw), we will make a mouth guard for the lower teeth as well. Feel free to inquire about mouth guards at your next appointment should you have any questions on what option will work best for you or your child. PreviousPrevious post:Time is Running Out!